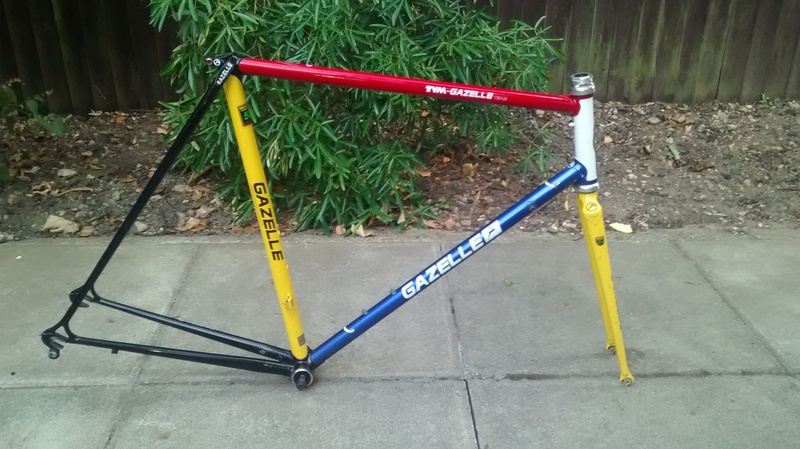 I present my Gazelle TVM, marmite team colour spec. You either love it or hate, In my opinion these are awesome and have always been high up my Gazelle list. 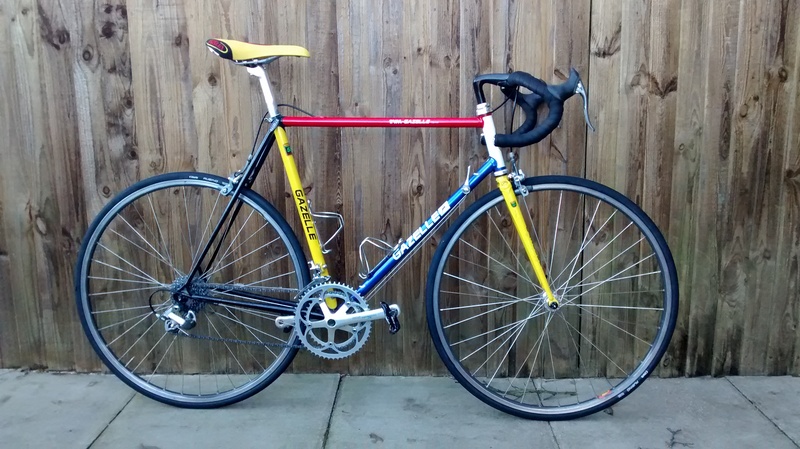 I've had it for nearly a year now, built up with Shimano 600 Ultegra for winter duty. Now it's time to do it full justice with Dura-Ace 7400. The threaded hole under the top tube looks a bit sorry for itself, but luckily the thread is fine. It doesn't' look like your conventional frame number hanger hole, and pretty sure its not for a pump hence the nib on the headtube. Anyone got any idea where I can get the correct bolt for this, just to plug the hole? I am also missing the top cap for my Cinelli Oyster stem. One of the prettiest frames I've seen, well jealous. 531? Size 58? I can't enlighten you with what was the correct fitting for that top tube braze on, as the TVM I had for a while that fitting was snapped off in the hole when I got the frame. I had to drill out the remains carefully and clean out the threads with a tap .. But the braze on is standard M5 bottle cage braze on. Looks like it's guiding the cable? Another pic of the bit you're looking for... Maybe it's just a mount for a racing number. Threaded hole is definitely meant to hold some kind of bracket for the number plate. It's in the right place too. Yes I agree, it just doesn't look like your normal fitting, as to my earlier AA-Super. Anybody know where I can get the correct fitting? You could use an angle bracket inbetween the hole an the plate. Then use bolts to fix the bracket to the frame and to the plate. You'd need to figure out what the threading is inside the hole but that's trial and error. 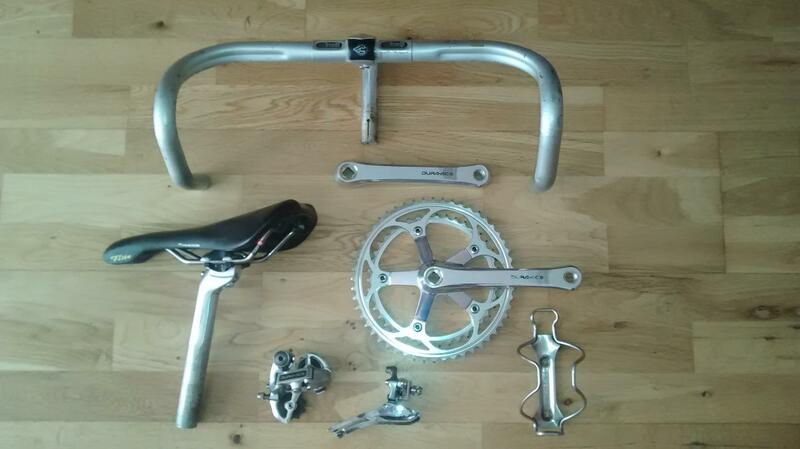 Can anyone help me track down some Dura-Ace BR-7403 callipers? this needs Sram red and reynolds attack... sell it to me!! That is so WRONG! Lol! 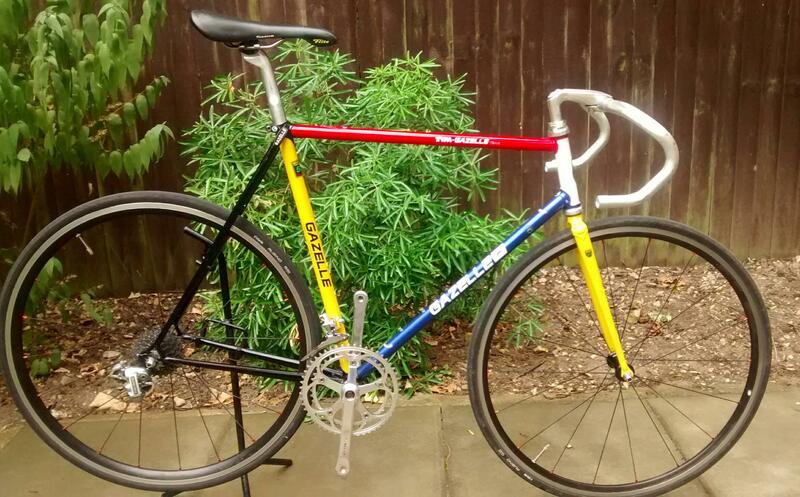 Mattyc, I did toy with the idea of a modern group, but I've got my Merckx which ticks that box. I'm sure you can grab one from eBay or Marktplaats. 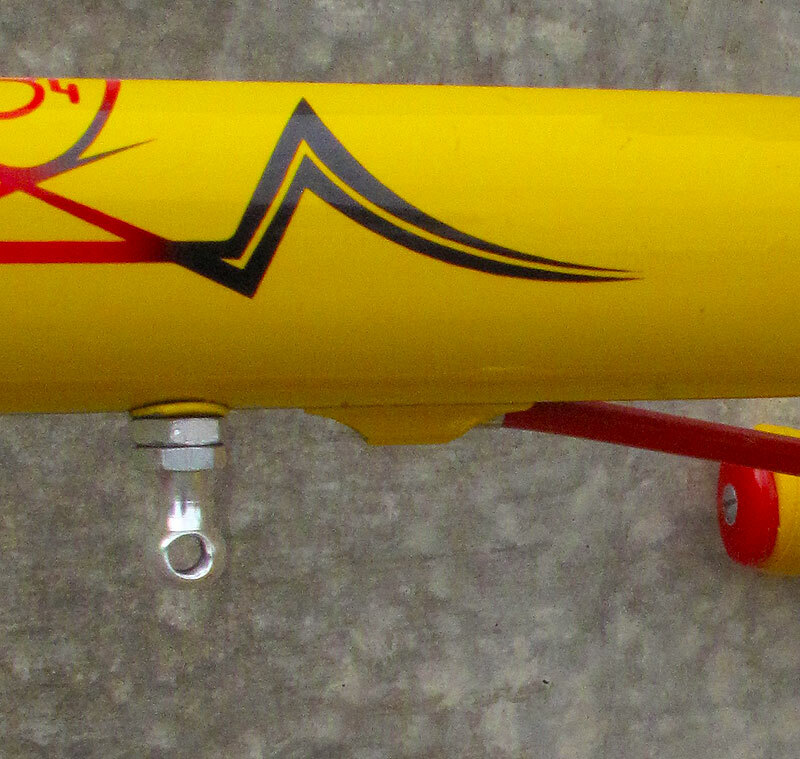 I have noticed my top tube cable routing & decals are slightly different from others in the brochures. 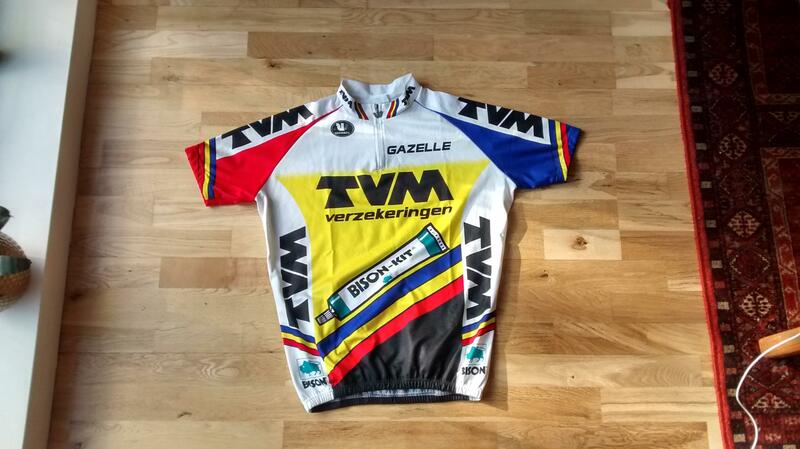 Judging from the frame stamp its an 1996, late production, slightly different decals maybe for the market outside of Netherlands. Could just be the earlier TVM had different decals and an external routing. Started to noticed a few with Reynolds 525 & raked fork. I had an ex-team lo pro in the same colourway....love it! Just how can you get hold of ex-team bikes/frames? I can do eBay, and a couple of forums, but that's my limited experience online. 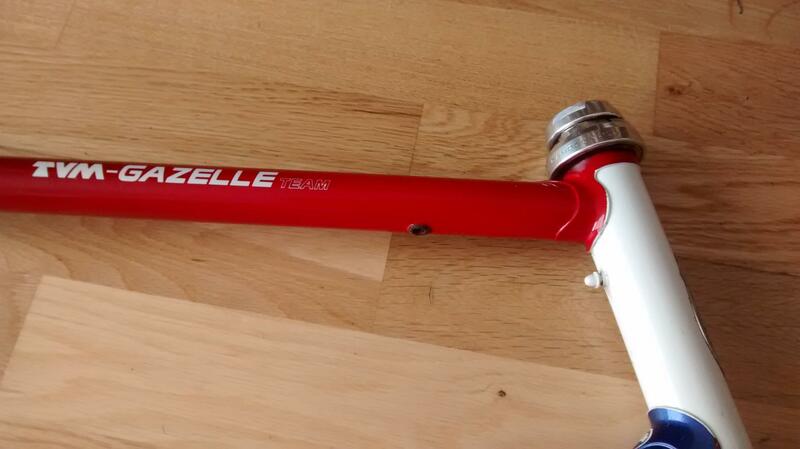 Nice colourway on that team of shame (TVM) frame, nice straight Precisa type forks as well. This is the bolt you need for the number hanger, it's the same as on my Merckx Team Alu. The eyeleted bolt goes into the top tube and the sliver disc with the rubber edge screws into the eyelet and holds the race card. 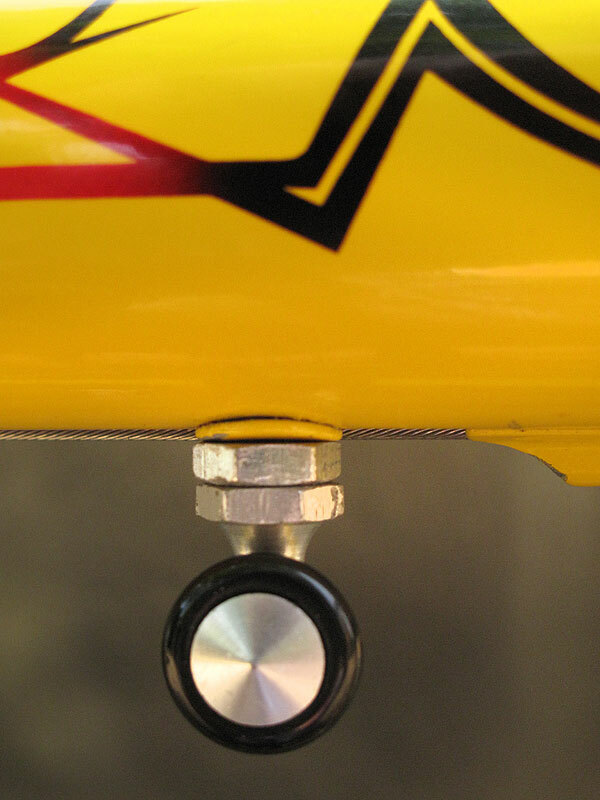 Oh yes, and the threading is the same as bottle cage mounts.